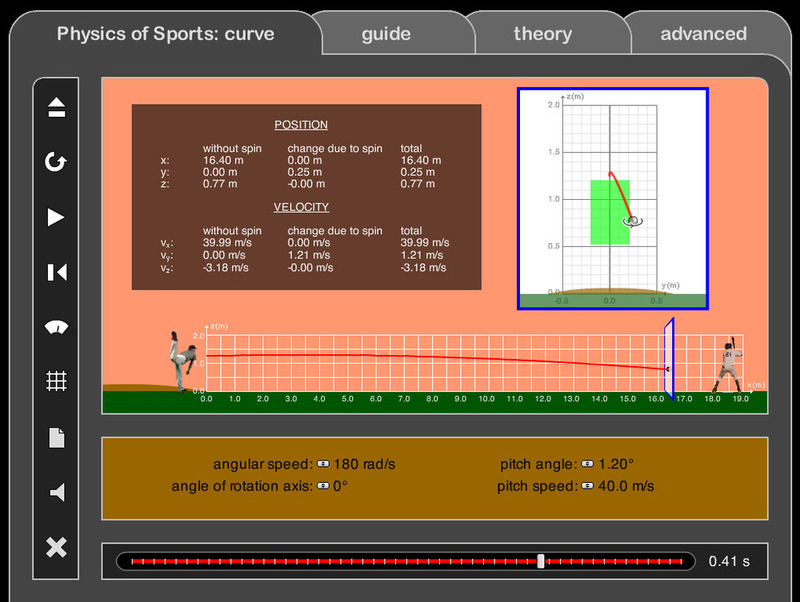 Physics of Sports is a collection of highly-interactive computer simulations illustrating the role played by physics principles in many popular sports. By precisely specifying changes in the diver’s body configuration over time, students observe how the resulting changes in the diver’s moment of inertia affect rotation and entry into the water. The motion of the diver's center of mass is also observed. Students take practice shots to find multiple shot-angles & launch-speeds that result in a basket, then determine those that allow for the greatest margin of error on the part of the shooter. Students explore factors that affect the velocity of a batted ball – including pitch speed, bat speed, ball mass, bat mass, contact point on bat, and coefficient of restitution. 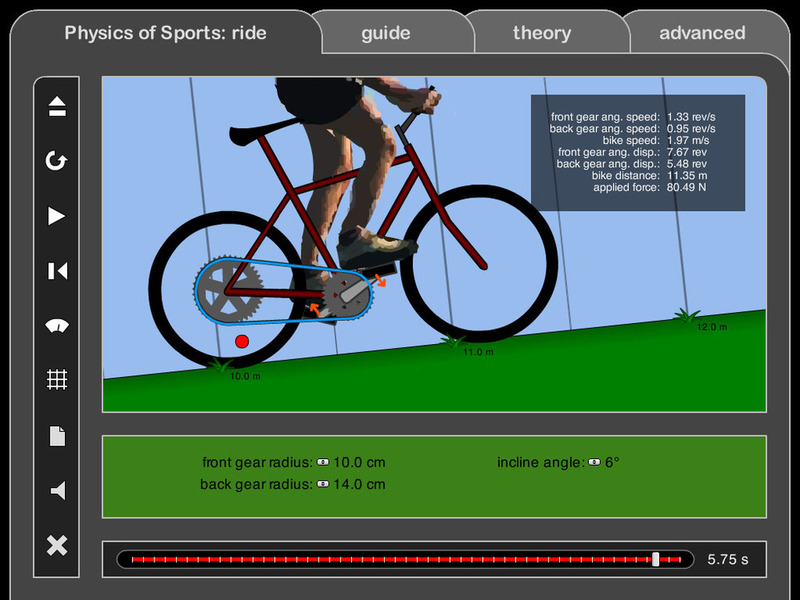 Students study how such variables as front gear radius, rear gear radius, and incline angle influence the speed of a bike and the applied force the biker must deliver to the pedals. By varying the angular speed, angle of rotation axis, and speed that a pitcher uses on a baseball, students examine the trajectory of a curveball resulting from the Magnus force. The trajectory is observed from the side view and batter's perspective. Being given control over the motion of various parts of the body during a vertical jump, students discover how the ground reaction force and center of mass associated with body configuration affect the height of the jump. The motion of a bungee jumper is examined in detail using real-world conditions. A free-body diagram is used to show the changing forces acting on the jumper, numerical displays show the velocity and rather large accelerations that can be experienced. Conservation of angular momentum is used to examine the motion of a gymnast swinging on a high bar. Given the ability to precisely specify changes in body configuration, students observe how the gymnast's changing moment of inertia and center of mass affect the swinging motion. The principles of impulse, rolling motion, and torque due to friction are illustrated as a billiard ball is hit with a cue stick causing it to roll and collide with another ball. Ball-to-table and ball-to-ball friction is taken into account. The user can vary the impulse of the cue stick and the point of impact to create top-spin or back-spin. Students study the motion of a race car on a circular track. By varying car speed, banking angle, track radius, and coefficient of friction, the resulting forces are examined with a free-body diagram. Physics of Sports is a collection of computer simulations that illustrate the role played by physics principles in many popular sports. Each simulation models a particular sport with the student given full control over the relevant variables, creating a highly interactive tool to perform in-depth studies. 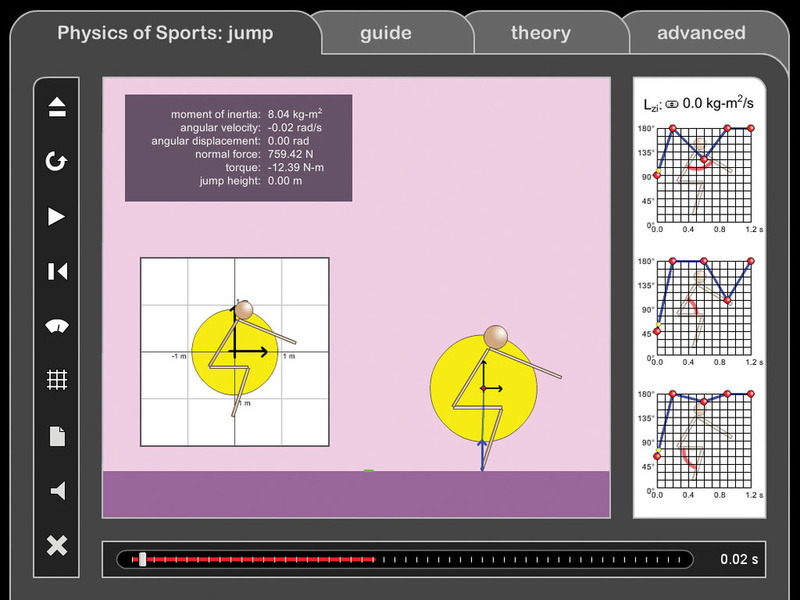 Physics of Sports may be used as an instructor lead demonstration in front of the classroom, or used by students as a computer-based lab activity. 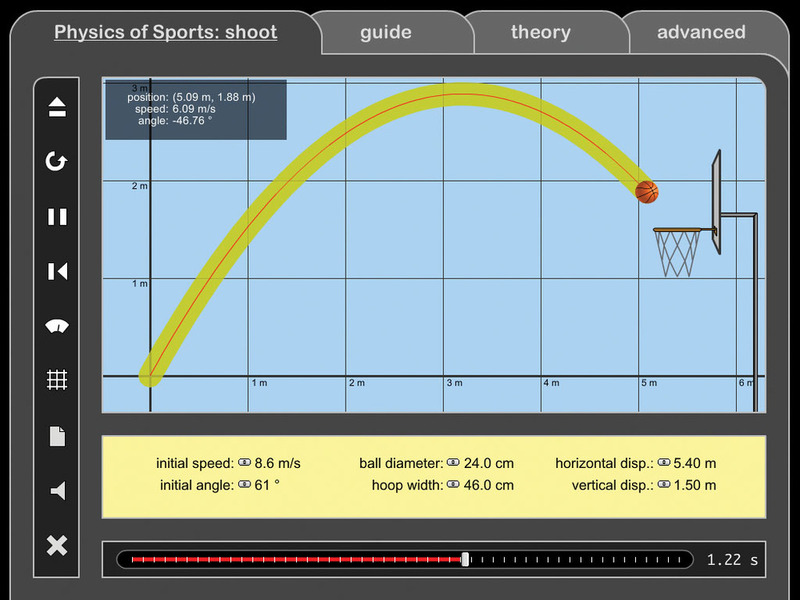 With a high-degree of physical accuracy and versatility built into each simulation, students can explore the answer to such questions as: how is the velocity of a batted ball influenced by the mass of the bat and the contact point along the bat, how does body configuration affect the rotation of a platform diver, what is the most forgiving angle at which to shoot a basketball, or how large are the forces experienced by a bungee jumper? Developed with the goal of capturing student interest, the program contains 15 stand-alone simulations that model physics principles from a variety of sports: basketball, baseball, gymnastics, diving, biking, downhill skiing, weight lifting, and many more. (1) Experiment screen where input parameters are varied and the resulting motion is animated. The instantaneous value of physical quantities is displayed with frame by frame playback control for detailed examination. (2) Advanced screen where results can be analyzed with the aid of graphs. 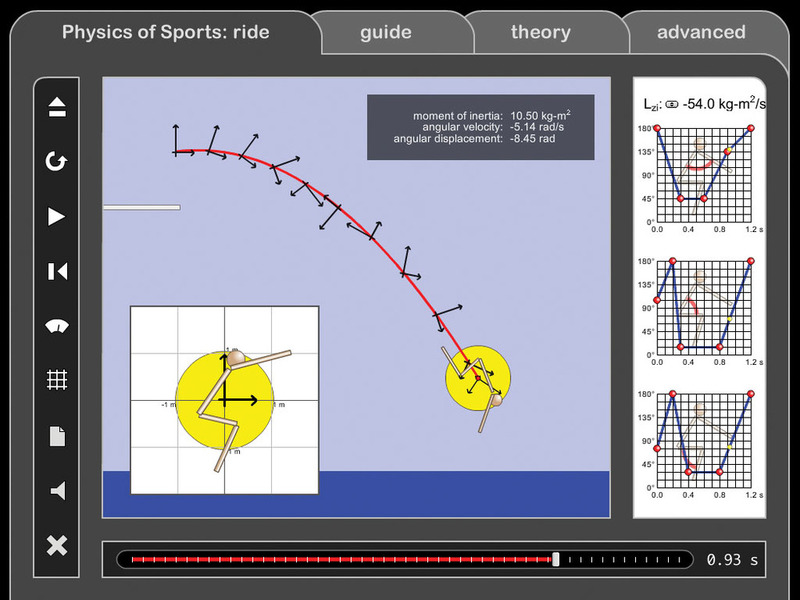 (3) Theory screen that details the physics principles and equations governing the sport. (4) Guide screen that provides detailed student guidance for performing the investigation. Preview the full version of Physics of Sports for 15 days—completely free with no obligation to purchase. Fill out and submit the Preview Request below to receive the download link and 15 day access code via email. Thank you for requesting to preview Physics of Sports. Your request has been successfully submitted. You will receive an email containing download information within 24 hours. Please don't hesitate to contact us with any questions.